Straight Path became a publicly traded company on August 1, 2013 when it was spunoff from IDT. Perhaps one of the largest holders of Millimeter Wave Spectrum bandwidth for future 5G based services in the United States. The only pureplay investment for the exploding value of Spectrum licenses. Our opinion is this is like buying real estate at a dramatic discount to current value, which we hope to explain in more detail in this report. We believe the company will be entertaining buyout offers as soon as 2016. Deploying networks with Straight Path Spectrum can be accomplished months and years quicker. Instead of waiting for permits to be granted and streets to be dug up, we can deploy instantly by placing energy efficient radios and antennas in easily accessible locations. Using our fixed wireless capacity is more energy efficient, as the data flows seamlessly through the air for miles, instead of being channeled through cables that need to be lit constantly. Straight Path Spectrum holds nearly 1,000 FCC spectrum licenses providing wireless coverage of the entire United States. We can provide a next generation solution for the networks of the future. We plan to replace the arcane conduits of the past with our spectrum, thereby increasing the capacity, flexibility, and efficiency of telecom and computer networks to provide high quality data content at a fraction of the cost. The company is not widely followed because it was spun out of IDT in 2013 and its very tightly held with no need to raise capital. That means Wall Street has little incentive to cover it with analysts, and therefore this remains well under the radar at this time. With no coverage, retail investors are not exposed to the story and that is where SRP likes to come in. Just as we have with CHRS at 14, XON at 19, DATA at 58, BLUE at 24 and the list goes on of multi-baggers we were early to expose to the market. For starters, take a look at the relative valuations of Spectrum licenses for Dish and Globalstar below as compared to STRP. STRP spun out of IDT in 2013 as a pureplay tracking stock if you will of the value of their 800 mhz of Bandwidth spectrum licenses. Initially, there were auctions in 1999 and 2000 during the peak of the Telecom boom for what are called “Millimeter Wave Spectrum” licenses. Current bands go up to 4 GHZ, or what is commonly referred to at 4G services for Mobile devices. In 1999 the FCC auctioned off 28 GHZ bandwidth licenses for 45 million of which STRP owns most of. In 2000, Winstar was the winner of 39 GHZ bandwidth auction for 410 million. Later, as they went bankrupt IDT bought out the assets for 60 million, and now this is trading and known collectively as Straight Path Communications. Essentially, the management at IDT controls 73% of the voting power of STRP and public shareholders only 27%. This tells you that they wanted to maintain control for potential future licensing or outright sale to a high bidder for their Spectrum licenses, which dominate the sector. Straight Path holds a near monopoly on millimeter wave spectrum in the United States, and is the single largest spectrum holding company in the U.S. today. There are only 12 million shares outstanding, so the current market cap is about 330 million, less than what the auction values were in 1999-2000 dollars. We will attempt to explain below why the current valuation accorded by the stock market is likely way below true current 2015 values, and certainly potentially well below 2020 values of these licenses as 5g Services are expected to be rolling out by the 2020 Olympics. Up until the recent 8-15 months it was commonly thought that the Millimeter Wave spectrum would not be suitable for the mobile data needs. Without getting into too much boring detail, the technical limitations were such that the older technology used by mm spectrum radios and devices had signal limitations. Essentially operating like a laser pointer, signals could be easily blocked and or not able to be transmitted accurately at all times. Although millimeter wave spectrum was capable of outperforming fiber, the then-available radios were not. The multi-gigabit per second promise of millimeter wave spectrum simply could not be realized by the millimeter wave radios available at the time. Compounding the problem, radios were expensive and installations were complex. If you recall from Telecom boom history, the companies building out last mile services over millimeter waves, including Winstar, wound up in bankruptcy court. However, the upside was and is that the broadband data speeds of MM wave spectrum are 100’s of multiples faster than the current typical LTE or 4G speeds used on mobile phones and devices today. In fact, the data speeds and rates are much faster than todays fastest fiber networks used inside buildings and corporate offices and more. Data speeds in excess of 100 megabits per second are already available to most wireless subscribers at home. In contrast, LTE mobile data speeds rarely exceed 20 megabits per second. Some corporate networks are running at 1 GB per second rates already, so its a matter of time until the mobile devices and users are going to demand and need much faster data rates, and again, this is where the MM spectrum that STRP controls will come into play. A typical cell phone for example in NYC operates on an LTE network with speeds of maybe 10-20 Megabytes a second for data. Now we have new state of the art technologies some 15 years after the last auction and MM wave spectrum tests that have been run by Samsung and others recently are showing multi Gigabytes per second! When the last auctions of MM wave spectrum licenses completed, the radios in the 1998-2001 period could not perform or take advantage of the massive data speed capabilities of these spectrum licenses which STRP has a near monopoly on. Hence they traded or were valued at a large discount to the current FCC wireless spectrum band (4ghz and below) licenses at current auction values. This discount is now starting to close, but still has massive upside potential. We liken it to buying Real Estate in NYC in 1960 for example, only the time frame for appreciation will be or could be quite rapid and out of the blue as it were for STRP shareholders (More on that later). With these new radio transmitter technologies, Samsung has led the way and now other carriers are swiftly following towards 5G Deployment technology as early as 2020, and it appears they will be using these MM wave spectrum to roll these high speeds out. South Korea for example is pledging 1.5 Billion for 5G services using millimeter wave technology. Intel has developed a MM wave antenna that operates on 39 GHZ (STRP Licenses) Bands and believe the only holdback now is not technology but moreso FCC changes. What has changed though in the past 12-15 months is the FCC Commissioner in October 2014 began calling for movement in the future from 4G networks to 60GHZ and even up to 90 GHZ networks. Again for reasons too lengthy to go into in this report, anything at 60-90GHZ is likely a long long ways off from working. However, the 28GHZ and 39 GHZ bands that STRP controls are in fact working very well in current testing by major mobile device makers and providers. Therefore, slowly but surely the market is beginning to change its perception of Millimeter Wave spectrum and its technology applications, and therefore the value of these is likely to continue to climb and later soar if we are right as these technologies continue to come to light. We have Intel, NTT Docomo, Samsung and others all developing 5G technologies now using MM spectrum. Basically over the next several years small cell deployments will be setting the stage for commercialization of MM wave mobile devices. The network density continues to grow and that plays right into the laser like abilities of MM waves and therefore STRP shareholders. Currently only privately held XO communications and Fiber Tower compete in these higher GHZ bandwidth spectrum holdings. STRP as we said earlier is the only pure play method to play this future increase in valuations publicly. In addition, they control the vast majority of this market with their 800 MHZ of total bandwidth. With some of the recent 12-18 month developments in technology, the valuation of STRP has begun to move up from $6 per share to a high of $33.90 per share recently until this recent pullback in price. In other words, the market has already increased the assumed current value from 72 million in late 2013 to 330 million in mid 2015, and we think this may be just a tip of the iceberg for STRP valuations. As we outline below, recent low priced valuations for spectrum auctions would place STRP value per share at near $2,000, not $30. A single license for 20 MHz of spectrum in the New York City market area sold in that auction for $2.76 billion, that alone would value STRP at $220 per share, except STRP has 40x that amount of bandwidth in their portfolio… more details below. Currently STRP controls 133 licenses in the 28 GHZ Band and 828 licenses in the 39 GHZ Band. The way the math works is this is also considered as 260 Billion MHZ-POPS country wide. (Points of presence). To give an example of current 4G type license spectrum values at a recent auction the winning bids were valued at the equivalent of $2.71 per MHZ POP. Applying that same valuation to STRP would place the price per share at $30,000 using a 15% discount rate over 5 years to todays value. If we were to take the lowest valuation of .18 cents per MHZ POP which was from a DISH acquisition in 2011 bankruptcy, we would still come up with $1,978 per share of STRP to get to that low end equivalent value. That $1,978 uses a 15% discount rate discounted back 5 years from 2020 to 2015 to get that figure! Further, the same article estimates the current market value of the 2011 Dish acquisition at 22 Billion! There is a looming spectrum crunch in the U.S. wireless industry, given the increasing data needs of mobile customers. Realizing this spectrum crunch and the associated opportunity, Dish Network has been strategically amassing spectrum. The company amassed 40 MHz of AWS-4 spectrum when it acquired TerreStar and DBSD North America out of bankruptcy in 2011 for a combined sum of less than $3 billion. We estimate the pre-tax value of the same spectrum to be close to $22.2 billion at $1.73 per MHz-Pop. A comparable transaction for somewhat ‘impaired’ higher frequency spectrum would be Sprint’s acquisition of Clearwire. Including the present value of the EBS leases, Sprint paid approximately $0.30 per MHz-POP. Applying that metric to Straight Path’s spectrum yields a valuation of $78 billion, or $3,200 per STRP share discounted over 5 years from 2020 to 2015 at 15% as well. To be more conservative assuming that an acquirer of Straight Path’s spectrum would value the spectrum on a market by market basis, Straight Path is still well below current market values. A single license for 20 MHz of spectrum in the New York City market area sold in that auction for $2.76 billion. 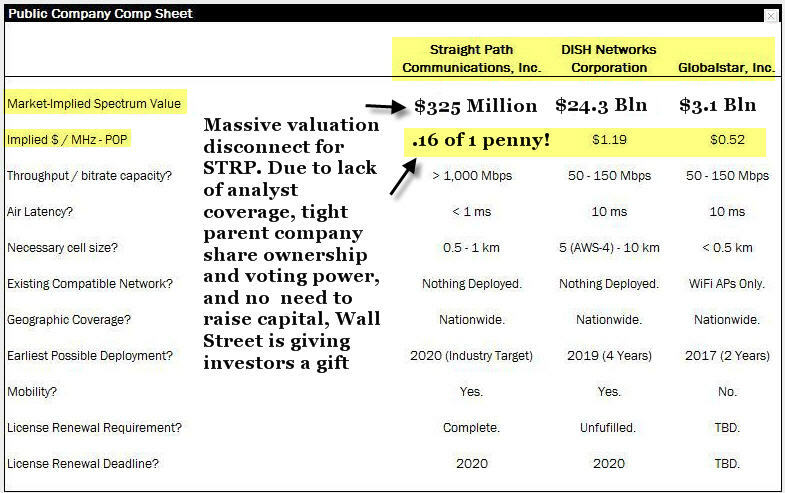 Straight Path holds a nationwide portfolio of over 800 MHz of spectrum and owns a like amount in New York City, all of which is valued by the market at a little over $330 million. Summary: The recent pullback in STRP shares came on light volume and due to traders who chased the stock up to 32-33 and are now taking a trading loss. We think the valuation at 330 million is way too low for a possible acquirer and represents tremendous value for patient investors in the stock. We would be buyers from 27-31 per share and plan to hold for 12-24 months if possible. 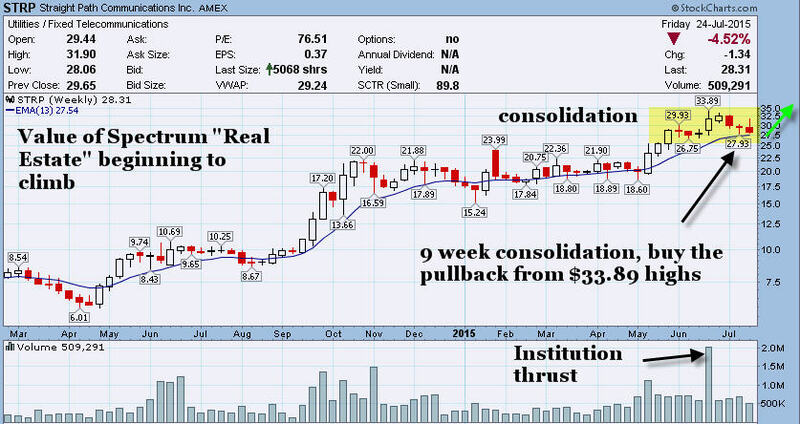 Buy Advice: The stock has been in a 9 week consolidation with a recent 4 week pullback from $33.89 highs. We can see in the chart that the $33.89 high was accompanied my massive volume of 2 million shares that week. There are only 12 million shares outstanding. Recently many traders got caught chasing the top and with the market pullback have taken their losses. This provides a good washout time to accumulate shares on the pullback in our opinion. We would accumulate shares from $27.50-$31 ranges inclusive and as projected. Use dips to add to positions, and do not pay more than $31. This stock can move quickly both on the upside and the downside due to the tightly held and small count share structure. However, those are the exact ingredients you want for long term explosive upside moves. Not a lot of shares to buy, and more demand than can be handled.